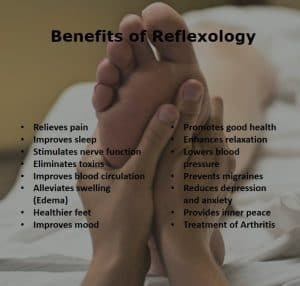 Reflexology is a natural, non-invasive healing art based on the principle that there are reflexes in the feet, hands and ears that correspond to every system, gland and organ in the body. There are over 7000 nerve endings in each foot which have extensive interconnections, through the spinal cord and brain, with all areas of the body. So basically the whole body can be mapped out on the feet. For example, the big toe correlating to the head. By working on these points with various finger and thumb techniques, there is an indirect stimulation to that part of the body. This encourages the body to re-balance that part by releasing tension. For example, I often see clients who have neck and shoulder tension, by working on the reflex points for the neck and shoulders on their feet, it encourages those areas to relax, allowing increased range of movement and a big reduction in pain. Another common problem I see regularly is people suffering with constipation, so by working on the stomach and bowel areas on their feet encourages them to be more active and effective. Many of us spend long hours on our feet every day. Whether you work in an office, in a hospital, a trades person, in a factory or anything in between, you put a lot of weight and pressure on your feet daily. Make a booking to come and see me, so I can relieve those tired and aching feet, reduce chronic pain and improve energy flow. Come and feel the benefits.